Here is the latest video of the work in progress to restore Killiney Beach Park. The ditch and culverts are going well from the looks of things. Drainage rock is being used to fill the ditch which should allow for more parking on that side of the road. With Okanagan Lake at its current low water level it appears that the beach sites themselves are smaller. This is probably because of the effort to raise the road level to protect it from future flooding. I have been told that work will commence upon the dock in the next week or so and I will get pictures of that when it happens. My only concern at the moment is the size of the “rip rap” being used to protect the road. If you look at the existing rocks that have bordered and protected this road for the last sixty years you will see the rocks that lasted were many times the size of the rocks currently being used. The smaller rocks pictures in the video and photo is what is currently being placed and come down to the normal high pool mark for the lake. The danger to the beach comes at this time if the lake level exceeds full pool as it did in both 2017 & 2018 and we get a significant storm with wave action. 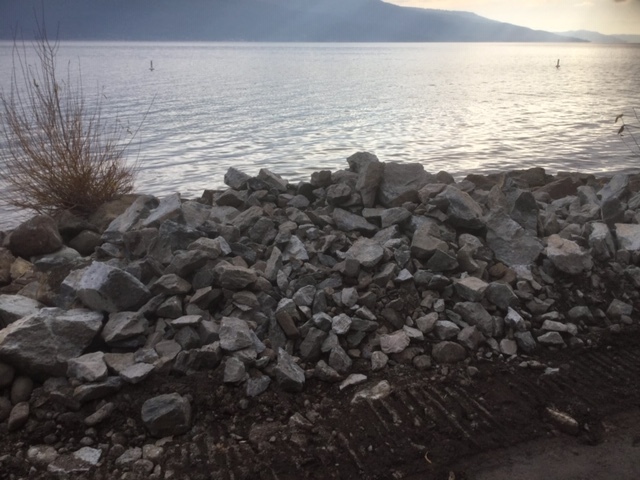 The waves on Okanagan Lake can reach 2-3 feet in height and have actually been recorded at up to 4 feet on this stretch of lake frontage. Should a storm hit the lake at full pool I believe that we could very well lose all of the restoration and improvements we are currently working on. 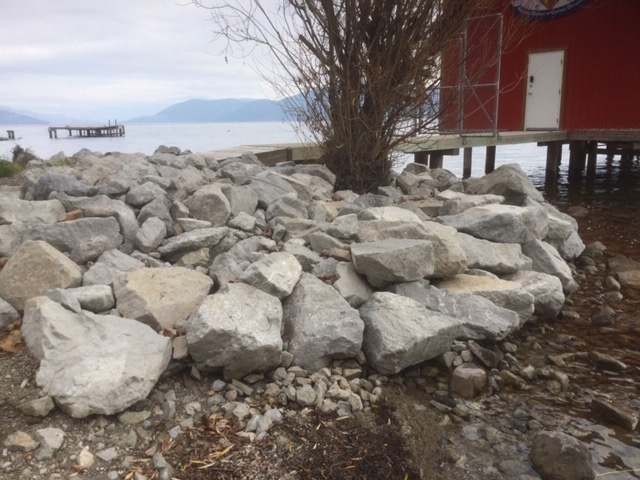 If you take a look at the rocks RDCO used to protect the ramp to the fire department boathouse you will see the these are far larger rocks that being used in the rest of the Killiney Beach Park foreshore. I, the NWCA and several local residents have brought this matter forward to RDCO staff & management. If you have concerns about this or any local service issue within the North Westside contact myself at wayne.carson@cord.bc.ca or contact the North Westside Communities Association. The NWCA Parks Committee meets regularly with RDCO Parks staff & management to provide local input and of course I can ask questions and request information from Staff and at the RDCO Board level. If you wish current updates on this and other matters pertaining to local services or functions within the community I would suggest that you subscribe to the NWCA Newsletter, these emails will keep you abreast of any and all matters North Westside.